alaTest has collected and analyzed 113 reviews of Lenovo Ideacentre Y900. The average rating for this product is 4.4/5, compared to an average rating of 4.2/5 for other Desktops for all reviews. People really like the reliability. The usability also gets good feedback, but there are some mixed comments about the size and price. We analyzed user and expert ratings, product age and more factors. Compared to other Desktops the Lenovo Ideacentre Y900 is awarded an overall alaScore™ of 96/100 = Excellent quality. 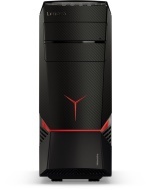 Lenovo has released several variants of the Lenovo IdeaCentre Y900 gaming PC. In this review, I'll talk about what the Razer Edition brings to the table. I've said it a few times, but this is a beast of a PC. It will run anything you can throw at it. The Razer keyboard/mouse are great inclusions. Some may not want to spend $2500USD on a PC, but you're getting high-end hardware, and that doesn't usually come cheap. Lenovo was kind enough to send us another ideacentre Y900 for review, this time with the new NVIDIA GTX 1080 graphics card to take a look at. Pretty sleek design, plenty of ports, optical audio, exceptional performance. Easy access to the interior for future upgrading. Price could be an issue for some.